The Anfield outfits are smoothly doing their business part of the game as they are making move for some players whom they believe will bring good fortune into the team in the coming season. Liverpool manager Jurgen Klopp is desperate to win a trophy with the Reds for the first time since he took charge of the team in 2014. He was close to winning his first trophy as Liverpool manager last season, but he was defeated 3-1 by Real Madrid in last season’s Champions League final match. In his bid not to see that happens in the upcoming season, the former Borussia Dortmund manager has signed Fabinho for £39.3m and Naby Keita. He is also linked with Lyon star Nabil Fekir but the latest rumors emerging from Anfield suggest that he has made a move for Nigerian winger Moses Simon as hope to provide a backup to Mohammed Salah in the coming season. 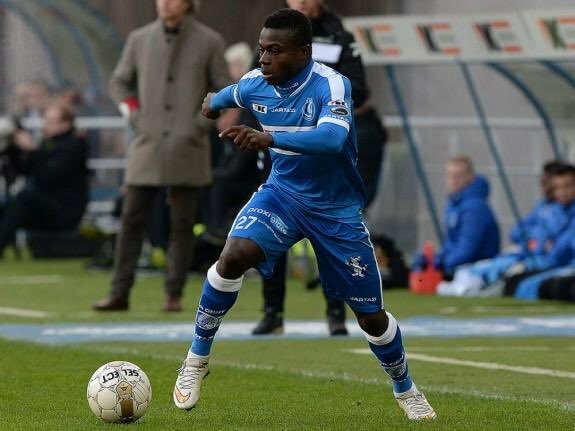 Simon Moses, 22, is a regular starter for Belgian club Gent and is reportedly going to cost the Reds a sum of £10m. The young player could operate from either flank but is being used as a left winger at Gent. With his current injury, the player won’t be joining the World Cup party with his country’s teammates as he won’t be fit for at least three weeks. Though Moses is relatively an unknown player to the Reds faithful, his dribbling skills at the flanks is one trait which would make him a great addition to the Jurgen Klopp’s team.